I knew the runes weren’t magic. After all, they were just some pebbles I’d gathered from the garden, cleaned up, and drawn some crude, random symbols on. I didn’t even perform a blood sacrifice or anything. So when I placed my hand in the bag and rattled them together, I couldn’t hear the distant winds of fate or the guiding call of my ancestors. It just sounded like – well, it sounded like pebbles rattling in a bag. And yet, as I singled one out at random and drew out my hand, I felt something. Or thought I did. A fleeting, nape-of-the neck thing. A curious sense of possibilities, all sharpening into focus. Which was silly, because the runes weren’t magic. They really weren’t. They were nothing more than a mathematical prop. 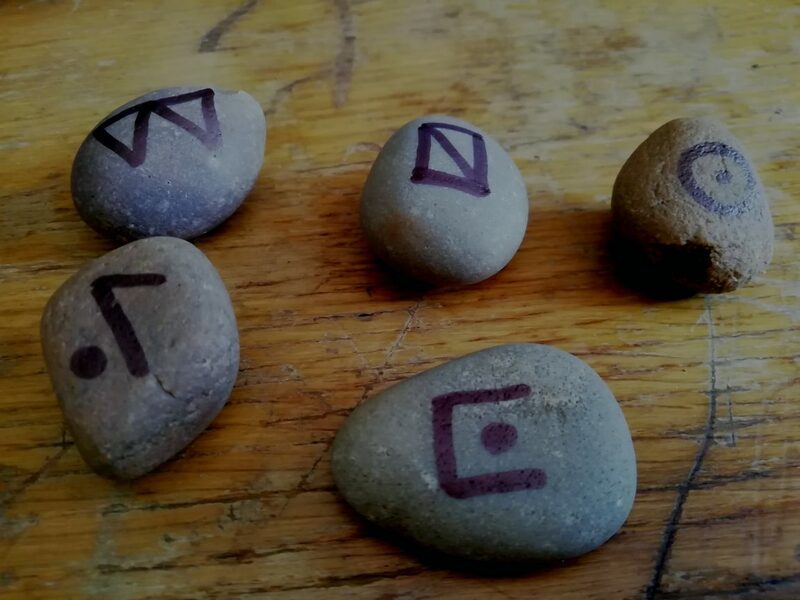 Before I go any further, I’ll explain: I’m about to go hunting in Red Dead Redemption 2 using the ancient art of runes and divination. Let’s explore the weird world of probability together. 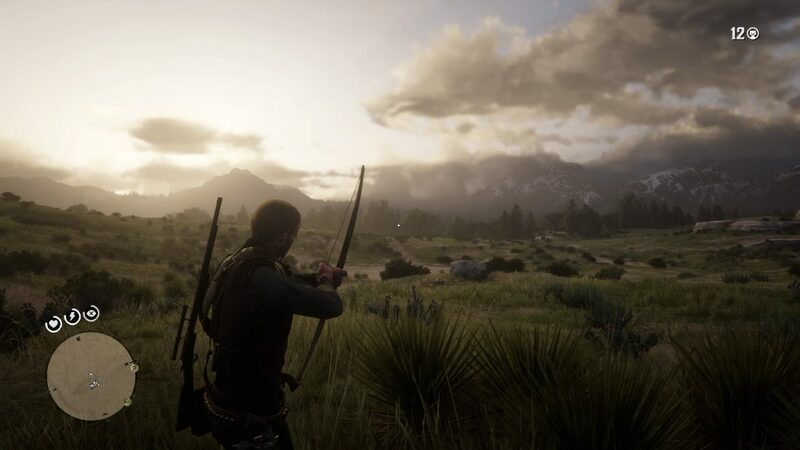 Red Dead Redemption 2 is many things to many people, but to me it’s a hunting simulator. In my head-cannon, I’m the sole provider for an entire camp, too lazy, too drunk, or too stupid to feed themselves. I’m not sure why I decided on this scenario, but I just keep coming back to it. You can keep your side missions, your Five Finger Fillet, your endless search for cigarette cards. I’m only here for the animal murder. Which poses an issue, because Red Dead can be a cruel mistress. 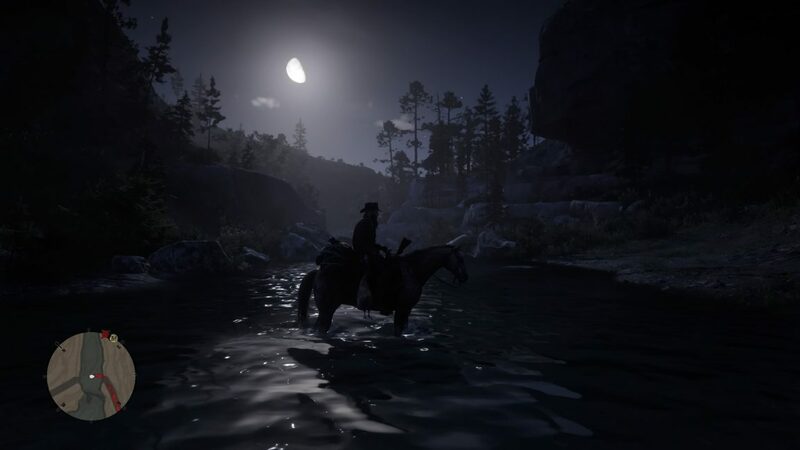 When you’re already on a mission and there are O’Driscolls on your tail, when you’re hungry and tired and you’re all shot to hell, when your horse is spooked and there’s a bounty on your head and you’re low on ammo – that’s always when that rare beaver skits along the periphery. The world will be teeming with life – western diamondback rattlers, screeching wild boar, flighty whitetail bucks and whooping cranes. During numerous spirited getaways, deer have darted into my horse’s path, knocking me sprawling. But when you’re all ready and safe and prepared to hunt, Red Dead pulls the tumbleweed act. Entire ecosystems vanish into the dusty air. Prairies, dense woodland and mountain trails become devoid of life. Nary a single one-star rabbit. It was during one of these dry spells that I began thinking about luck, probability, and how I might improve my yield. Maybe there was another way to hunt. I had maps and small-game arrows, a completed compendium and Arthur’s sixth-sense mechanic. But maybe these things, maybe logic itself, were holding me back. In 1957, anthropologist Dr. Omar Moore studied the hunting practices of the Montagnais-Naskspi, a Native American tribe who read burning caribou bones to direct where they hunted. He wrote that “some practices that have been classified as magic may well be directly efficacious as techniques for attaining the ends envisaged by their practitioners.” Or, put simply, people used magic, or caribou bones, or runes, or whatever, to hunt because it worked. It’s an easy idea to mock, but analytical thinking might offer up an insight into why divination hunting traditions have flourished in cultures across the globe. It goes like this – if hunters use only logic, they are likely to keep returning to places where they have hunted successfully before. But prey lean toward more random behaviour, especially if they are aware of predators in the area. Over-hunting in the same locations leads to wary prey. Introducing a random element into the decision of where or what to hunt may therefore have allowed the hunters to match their prey’s random behaviour. People who used runes, sticks, or haruspication (using animal entrails to predict the future) are likely to have increased their hunting yields. It was an idea that I just couldn’t pass up, though I decided to skip out the animal entrails. The rules were simple: two playthroughs, one hour (real-time) each, logic vs divination. Sixth sense was allowed, but no Dead-Eye. 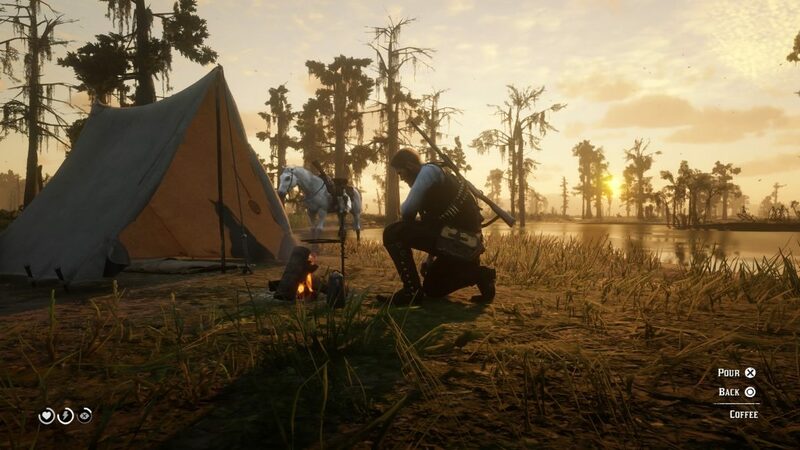 I’d only go after three-star animals (Arthur only has so much satchel space for meat) and wouldn’t bother with Legendaries (because they’re more like one-off scripted events). I’d ignore all side missions and cries for help, and try to keep the law on my side. Highest total value of animal parts at the end of one hour’s hunting would crown the winning strategy. For the first run, I’d use my normal techniques – checking the map, using binoculars, going to places that I knew. I have a few favourite spots and know my way around a rifle. I quickly caught a whole bunch of animals, using my compendium to match my weapon and ammo-type to my prey. At one point I raced along a mudflat in Bayou Nwa, dodging a cranky american alligator and picking off a reddish egret at the same time. After an hour’s stalking of my favourite spots, I had a good haul to take to the trapper near Annesburg. From the Rocky Mountain cow elk I shot next to the Kamassa River, to the American red squirrel I found in Scarlet Meadows, I amassed a respectable $116.11 worth of meat, pelts, and feathers. So I reset the timer and started the divination run, my bag of rocks rattling into place besides me. I set the mini-map to become a compass. I reached into the bag and took out a rune, following its instruction (move north), and the funniest thing happened. I saw something dangling from a tree, a single god-ray of light singling it out: a dreamcatcher. I took it as a good omen. I immediately smashed my horse into a tree. I had started at the same time and place as before, 6am in Roanoke Ridge. Using the compass was actually quite difficult due to the darkness and lack of contrast on this element of the HUD. But, squinting at the bottom left corner of my TV for guidance, it wasn’t long before I found my first three-star animal: a fine pronghorn doe. Hoping I’d picked the right rifle, I cautiously moved closer. I checked that my scent was blowing downwind and crouched in a patch of long grass to line up my shot. The doe stood stock still, as if aware of its fate. A few high clouds rolled overhead, pushing shadows across the plains. I breathed out, squeezing the trigger. A sharp gunshot cracked the still air. The doe trembled, bleated, and fell to the floor. With the mini-map removed, I noticed how much I had previously relied on it to navigate the terrain safely. I felt blind without its reassuring contour lines: sudden gullies and steep drops were a constant threat. And this meant that I paid more attention to the world, to the subtle signs my horse made. I was more aware of the sky, how its slow cycle through cool pastels to warm vibrant tones gave a different character to each hour, how cloud-cover and fog affected my vision. I selected a few more runes and was led to a couple of easy, small-mammal kills. I noticed that by chance I’d had a fair run of instructions to head north and I found myself in the icy tundra of Mount Hagen. And here is where the runes showed their true worth. I’d stumbled into an area that I rarely bothered venturing to, the north-western snow-swept region near Lake Isabella. The runes had guided me to the lake’s edge. It was real cowboy-cold up there, so I stopped to change into my Winter Gunslinger outfit. And there it was. The fabled white arabian, the absolute best wild horse in the game. Now I know that taming horses isn’t strictly hunting, but I had the wild notion that the runes had led me here on purpose. It was so out of the way, and the horse was so famously elusive that I had never bothered to try find it. But the runes led me here, so I was convinced that I should spend the last few minutes of my run taming this incredible creature. It was tense, and I was bucked off a few times, but finally I tamed her. So, gleaming white arabians aside, did the runes have the desired effect? Had I caught more prey? Sadly not. The figures don’t lie: in my divination run, I bagged a total of $63.50 worth of meat and pelts – much lower than the control run. I shouldn’t have been so surprised: Red Dead is a video game and the virtual wildlife is obviously limited in its simulation. Even if they behave realistically enough moment-to-moment, I’m pretty sure that the animals don’t learn where you like to hunt. So you could argue that my weird experiment was a failure. But if I look back at it as an experience, I can’t deny the positive effects. I’m not sure if I was just focusing harder on my surroundings because I didn’t have a map, but I felt more connected to the landscape, more aware of the weather and lighting, more in tune with the animals. I’m not trying to “paint with all the colours of the wind”, but I definitely treated the animals as if they were real, instead of a herd of animated systems. Plus, I did find that sweet horse – something I never thought I’d bother with. The runes are not magic, I know that. But as I swap discs, fire up Destiny and head down to the Dreaming City on the hunt for another Ascendant Challenge, I don’t check online for the location of the portal. Instead, my hand automatically reaches for the runes. The familiar rattle, the intoxicating pull of chance. Head north, Lady Luck whispers to me. 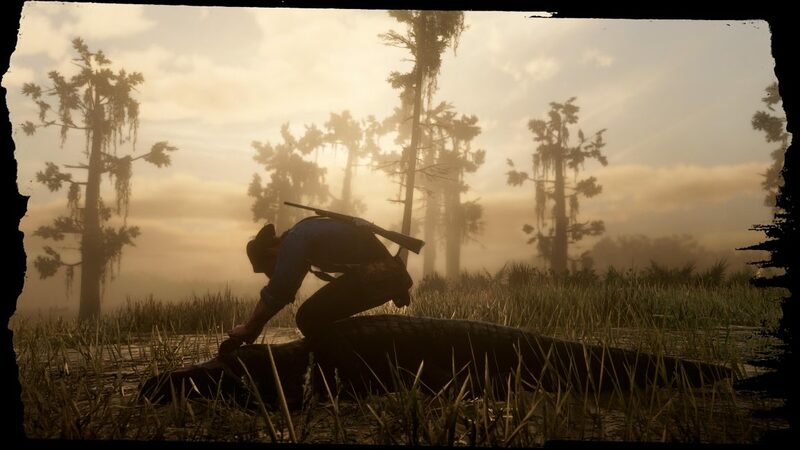 The post Using hunting runes to track wild animals in Red Dead Redemption 2 appeared first on VG247.